This sounds like good news, although it remains to be seen whether some files will continue to be withheld by the president. As the main outlet probing this and other transformative “cold cases,” WhoWhatWhy has pointed out that many questions remain unanswered and many key issues unresolved. Once the documents are released, we’ll turn loose our crack team of document analysts and report back our findings. What possible connection could there have been between George H.W. Bush and the assassination of John F. Kennedy? Or between the CIA and the assassination? Or between Bush in the 1960s and the CIA? For some people, apparently, making such connections was as dangerous as letting one live wire touch another. Here, in anticipation of the forthcoming final release of long-classified JFK assassination records, is an excerpt from WhoWhatWhy editor Russ Baker’s bestseller, Family of Secrets: The Bush Dynasty, America’s Invisible Government and the Hidden History of the Last Fifty Years. The story is a real-life thriller. Note: Although these excerpts do not contain footnotes, the book itself is heavily footnoted and exhaustively sourced. This article first appeared 9/16/2013. When Joseph McBride came upon the document about George H. W. Bush’s double life, he was not looking for it. It was 1985, and McBride, a former Daily Variety writer, was in the library of California State University San Bernardino, researching a book about the movie director Frank Capra. Like many good reporters, McBride took off on a “slight,” if time-consuming, tangent — spending day after day poring over reels of microfilmed documents related to the FBI and the JFK assassination. McBride had been a volunteer on Kennedy’s campaign, and since 1963 had been intrigued by the unanswered questions surrounding that most singular of American tragedies. [We have been] advised that the Department of State feels some misguided anti-Castro group might capitalize on the present situation and undertake an unauthorized raid against Cuba, believing that the assassination of President John F. Kennedy might herald a change in U.S. policy… [Our] sources know of no [such] plans… The substance of the foregoing information was orally furnished to Mr. George Bush of the Central Intelligence Agency and Captain William Edwards of the Defense Intelligence Agency. McBride shook his head. George H. W. Bush? In the CIA in 1963? Dealing with Cubans and the JFK assassination? Could this be the same man who was now vice president of the United States? Even when Bush was named CIA director in 1976 amid much agency-bashing, his primary asset had been the fact that he was not a part of the agency during the coups, attempted coups, and murder plots in Iran, Cuba, Chile, and other hot spots about which embarrassing information was being disclosed every day in Senate hearings. For CIA director Bush, there had been much damage to control. The decade from 1963 to 1973 had seen one confidence-shaking crisis after another. There was the Kennedy assassination and the dubious accounting of it by the Warren Commission. Then came the revelations of how the CIA had used private foundations to channel funds to organizations inside the United States, such as the National Student Association. Then came Watergate, with its penumbra of CIA operatives such as E. Howard Hunt and their shadowy misdoings. Americans were getting the sense of a kind of sanctioned underground organization, operating outside the law and yet protected by it. Then President Gerald Ford, who had ascended to that office when Richard Nixon resigned, fired William Colby, the director of the CIA, who was perceived by hard-liners as too accommodating to congressional investigators and would-be intelligence reformers. Now Ford had named George H. W. Bush to take over the CIA. But Bush seemed wholly unqualified for such a position — especially at a time when the agency was under maximum scrutiny. He had been U.N. ambassador, Republican National Committee chairman, and the U.S. envoy to Beijing, where both Nixon and Henry Kissinger had regarded him as a lightweight and worked around him. What experience did he have in the world of intelligence and spying? How would he restore public confidence in a tarnished spy agency? No one seemed to know. Or did Gerald Ford realize something most others didn’t? 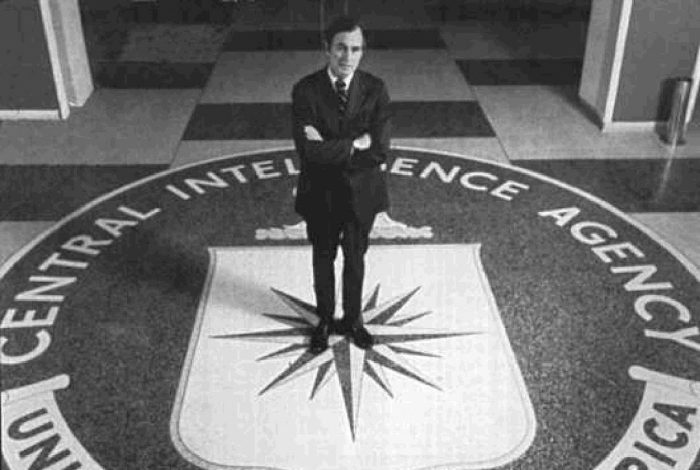 Bush served at the CIA for one year, from early 1976 to early 1977. He worked quietly to reverse the Watergate-era reforms of CIA practices, moving as many operations as possible offshore and beyond accountability. Although a short stint, it nevertheless created an image problem in 1980 when Bush ran unsuccessfully for the Republican presidential nomination against former California governor Ronald Reagan. Some critics warned of the dangerous precedent in elevating someone who had led the CIA, with its legacy of dark secrets and covert plots, blackmail and murder, to preside over the United States government. In 1985, when McBride found the FBI memo apparently relating to Bush’s past, the reporter did not immediately follow up this curious lead. Bush was now a recently reelected vice president (a famously powerless position), and McBride himself was busy with other things. By 1988, however, the true identity of “Mr. George Bush of the CIA” took on new meaning, as George H. W. Bush prepared to assume his role as Reagan’s heir to the presidency. Joe McBride decided to make the leap from entertainment reportage to politics. He picked up the phone and called the White House. * Did you do any work with or for the CIA prior to the time you became its director? * If so, what was the nature of your relationship with the agency, and how long did it last? * Did you receive a briefing by a member of the FBI on anti-Castro Cuban activities in the aftermath [of] the assassination of President Kennedy? Within half an hour, Hart called him back. The spokesman now declared that, though he had not spoken with Bush, he would nevertheless answer the questions himself. Hart said that the answer to the first question was no, and, therefore, the other two were moot. But it appears this standard policy was made to be broken. McBride’s revelations appeared in the July 16, 1988, issue of the liberal magazine the Nation, under the headline “The Man Who Wasn’t There, ‘George Bush,’ C.I.A. Operative.” Shortly thereafter, CIA spokeswoman Sharron Basso told the Associated Press that the CIA believed that “the record should be clarified.” She said that the FBI document “apparently” referred to a George William Bush who had worked in 1963 on the night shift at the Langley, Virginia, headquarters, and that “would have been the appropriate place to have received such an FBI report.” George William Bush, she said, had left the CIA in 1964 to join the Defense Intelligence Agency. Certainly, the article caused George H. W. Bush no major headaches. By the following month, he was triumphantly accepting the GOP’s presidential nomination at its New Orleans convention, unencumbered by tough questions about his past. CIA can’t find “other” George Bush? Meanwhile, the CIA’s Basso told reporters that the agency had been unable to locate the “other” George Bush. The assertion was reported by several news outlets, with no comment about the irony of a vaunted intelligence agency — with a staff of thousands and a budget of billions — being unable to locate a former employee within American borders. Perhaps what the CIA really needed was someone like Joseph McBride. Though not an investigative journalist, McBride had no trouble finding George William Bush. Not only was the man findable; he was still on the U.S. government payroll. By 1988 this George Bush was working as a claims representative for the Social Security Administration. He explained to McBride that he had worked only briefly at the CIA, as a GS-5 probationary civil servant, analyzing documents and photos during the night shift. Moreover, he said, he had never received interagency briefings. Several years later, in 1991, former Texas Observer editor David Armstrong would track down the other person listed on the Hoover memo, Captain William Edwards. Edwards could confirm that he had been on duty at the Defense Intelligence Agency the day in question. He said he did not remember this briefing, but that he found the memo plausible in reference to a briefing he might have received over the phone while at his desk. While he said he had no idea who the George Bush was who also was briefed, Edward’s rank and experience was certainly far above that of the night clerk George William Bush. Shortly after McBride’s article appeared in the Nation, the magazine ran a follow-up op-ed, in which the author provided evidence that the Central Intelligence Agency had foisted a lie on the American people. The piece appeared while everyone else was focusing on Bush’s coronation at the Louisiana Superdome. As with McBride’s previous story, this disclosure was greeted with the equivalent of a collective media yawn. An opportunity was bungled, not only to learn about the true history of the man who would be president, but also to recognize the “George William Bush” diversion for what it was: one in a long series of calculated distractions and disinformation episodes that run through the Bush family history. With the election only two months away, and a growing sense of urgency in some quarters, George William Bush acknowledged under oath — as part of a deposition in a lawsuit brought by a nonprofit group seeking records on Bush’s past — that he was the junior officer on a three- to four-man watch shift at CIA headquarters between September 1963 and February 1964, which was on duty when Kennedy was shot. “I do not recognize the contents of the memorandum as information furnished to me orally or otherwise during the time I was at the CIA,” he said. “In fact, during my time at the CIA, I did not receive any oral communications from any government agency of any nature whatsoever. I did not receive any information relating to the Kennedy assassination during my time at the CIA from the FBI. Based on the above, it is my conclusion that I am not the Mr. George Bush of the Central Intelligence Agency referred to in the memorandum.” . . . But yet another decade would pass before this second document would be found, read, and revealed to the public. Fast-forward to December 2006, on a day when JFK researcher Jerry Shinley sat, as he did on so many days, glued to his computer, browsing through the digitized database of documents on the Web site of the Mary Ferrell Foundation. Through Mr. Gale Allen . . . I learned that Mr. George Bush, DCI designate has prior knowledge of the now terminated project WUBRINY/LPDICTUM which was involved in proprietary commercial operations in Europe. He became aware of this project through Mr. Thomas J. Devine, a former CIA Staff Employee and later, oil-wildcatting associate with Mr. Bush. Their joint activities culminated in the establishment of Zapata Oil [sic] [in 1953] which they eventually sold. After the sale of Zapata Oil, Mr. Bush went into politics, and Mr. Devine became a member of the investment firm of Train, Cabot and Associates, New York . . . The attached memorandum describes the close relationship between Messrs. Devine and Bush in 1967-1968 which, according to Mr. Allen, continued while Mr. Bush was our ambassador to the United Nations. In typical fashion for the highly compartmentalized and secretive intelligence organization, the memo did not make clear how Bush knew Devine, or whether Devine was simply dropping out of the spy business to become a true entrepreneur. For Devine, who would have been about twenty-seven years old at the time, to “resign” at such a young age, so soon after the CIA had spent a great deal of time and money training him was, at minimum, highly unusual. It would turn out, however, that Devine had a special relationship allowing him to come and go from the agency, enabling him to do other things without really leaving its employ. In fact, CIA history is littered with instances where CIA officers have tendered their “resignation” as a means of creating deniability while continuing to work closely with the agency . . .
Devine’s role in setting up Zapata would remain hidden for more than a decade — until 1965. At that point, as Bush was extricating himself from business to devote his energies to pursuing a congressional seat, Devine’s name suddenly surfaced as a member of the board of Bush’s spin-off company, Zapata Offshore — almost as if it was his function to keep the operation running. To be sure, he and Bush remained joined at the hip . . .
Devine, like the senior George Bush, is now in his eighties and still active in business in New York. When I reached him in the winter of 2007 and told him about recently uncovered CIA memos that related both his agency connections and his longtime ties to Bush, he uttered a dry chuckle, then continued cautiously. Thomas Devine: I just broke one of the first rules in this game. Russ Baker: And what is that? Thomas Devine: Do not complain. In fact, Devine had little to complain about. At the time, although I was aware that he seemed to be confirming that he himself had been in the “game,” I did not understand the full extent of his activities in conjunction with Bush. Nor did I understand the heightened significance of their relationship during the tumultuous event of 1963, to be discussed in subsequent chapters. Before there was an Office of Strategic Services (July 1942-October 1945) or a Central Intelligence Agency (founded in 1947), corporations and attorneys who represented international businesses often employed associates in their firms as private agents to gather data on competitors and business opportunities abroad. So it was only to be expected that many of the first OSS recruits were taken from the ranks of oil companies, Wall Street banking firms, and Ivy League universities and often equated the interests of their high-powered business partners with the national interest. Such relationships like the one between George H. W. Bush and Thomas Devine thus made perfect sense to the CIA . . .
By the time George H. W. Bush founded his own company, Zapata Petroleum, it was not difficult to line up backers with long-standing ties to industrial espionage activities. The setup with Devine in the oil business provided Bush with a perfect cover to travel abroad and . . . identify potential CIA recruits among foreign nationals . . .
“Poppy” Bush’s own role with intelligence appears to date back as early as the Second World War, when he joined the Navy at age eighteen. On arrival at his training base in Norfolk, Virginia, in the fall of 1942, Bush was trained not only as a pilot of a torpedo bomber but also as a photographic officer, responsible for crucial, highly sensitive aerial surveillance . . .
After mastering the technique of operating the handheld K-20 aerial camera and film processing, Bush recruited and trained other pilots and crewmen. His own flight team became part bomber unit, part spy unit. The information they obtained about the Japanese navy, as well as crucial intelligence on Japanese land-based defenses, was forwarded to the U.S. Navy’s intelligence center at Pearl Harbor and to the Marine Corps for use in planning amphibious landings in order to reduce casualties. The so-called Operation Snapshot was so hush-hush that, under naval regulations in effect at the time, even revealing its name would lead to court-martial. According to a book by Robert Stinnett, a fellow flier, Admiral Marc Mitscher hit the “bulkhead” when he saw that Bush’s team had filed a report in which they actually referred by name to their top-secret project. The three people above Bush in his command chain were made to take razor blades to the pages of the report and remove the forbidden language. The lesson was apparently not lost on Bush. From that moment forward, as every Bush researcher has learned, Bush’s life would honor the principle: no names, no paper trail, no fingerprints. If you wanted to know what Bush had done, you had to have the patience of a sleuth yourself. For Part 3, please go here; Part 4, here; Part 5, here; Part 6, here; Part 7, here; Part 8, here; Part 9, here; Part 10, here. Related front page panorama photo credit: Adapted by WhoWhatWhy from George H. W. Bush (The White House / Nixon Foundation) and 60’s Dallas (coltera / Flickr – CC BY-NC-SA 2.0).